Offering you a complete choice of products which include control desk panels and plc control panels. We are leading manufactures of Control Desk Panels. These electronic panels have gain wide prominence in the industry for their optimum performance, easy installation, longer functional life and reliability. Our these instruments are fitted with all necessary control features such as fault declaration with mimic diagrams, hooters and instrumentation. 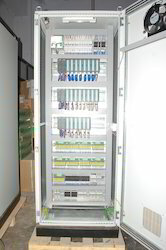 We offer wide range of PLC Control Panels to our valuable clients in various size and shapes. 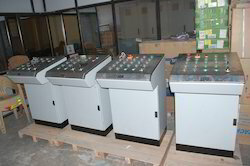 These control panels are equipped with man machine interface, which display displays any kind of fault description and communicates data to Plc and operator. Plc panels supplied by us find wide application in several industries industries like auto mobile, engineering, water treatment plant, effluent treatment plants, paper and printing, chemical and process plants. Looking for Automation Panel ?